These are three 78rpm LP’s, that a Dutch family recorded for their (grand)mother, who had emigrated to South Wales, Australia in 1949 or 1950. The family had these records made in 1950, in a recording studio, during a trip to London. 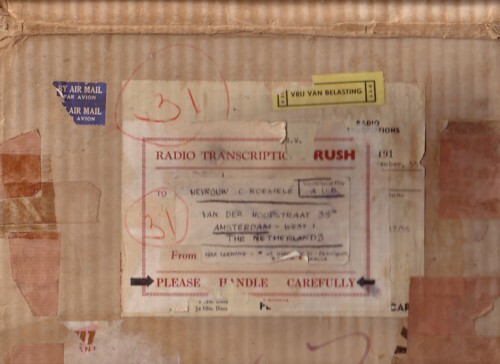 The records contain an audio letter for the (grand)mother’s birthday. For mysterious reasons the message is divided over a double-sided 12 inch LP, a one-sided 12 inch LP and a one-sided 10 inch LP. 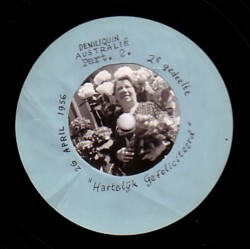 All 78rpm records are still in the original package in which they travelled both from Holland to Australia and from 1955 to 2007. It was not unusual for emigrants to go a studio and record a record for the family back home, or the other way around. But I have never seen or heard a triple LP before in this genre. On most of these records people don’t know what to say. They are intimidated by the studio and the fact that their voice is being recorded, in most cases for the first time in their lives. But there is almost always something on these audio letters that breaks my heart: a tone, a sentence or even a single word. 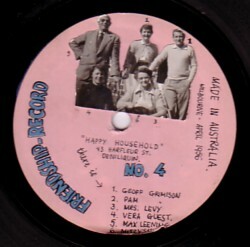 The family on this record had not seen their (grand)mother after she left for Australia. The (grand)mother heard the voice of one of the children for the first time. And the kid only speaks a few words Dutch. I can hear something in the mother’s voice that expresses more love than i can hear in all the records that are in today’s Top 40. Why they recorded three LP’s is not clear; there is not much interesting being said and on the forth side they even get a neighbour in front of the microphone to talk to (grand)mother, without even knowing her. Have such one-of-one records made in a studio was probably expensive in 1955, and I cannot imagine that the family did it all for me and you. But Life moves in mysterious ways, so who is to say.